It has been a year already since I was in Colorado for a week where I spent a few days skiing in Aspen. I live in Texas so it is not so easy to just jump in the car and go skiing like I used to do when I lived in Norway, and this is something I miss being able to do. Well don’t you know? I can jump in my car in Austin, Texas and go skiing. Only drawback I have to drive for 8 to 9 hours to find a mountain with snow on it. The mountain is Ski Apache close to Ruidoso, New Mexico. Texas is a large state with many roads, so I had to find out what was the best route to go. Since most Texas rural roads have speed limits at 70 or 75 mph, I decided on the route that looked like the shortest. I started around 2:30PM on a Friday afternoon and drove north on 183 all the way to Brownwood, where I turned west towards Santa Anna, Coleman, and Winters. Then I turned north towards Sweetwater where I drove a few miles westward on I-20 before I again turned north towards Post, TX. I have always love driving and when I was in Bergen College of Engineering I drove a taxi every other weekend to make some extra money. Texas is a great state and there is lots of things to see. There have been pump jacks spread over Texas for almost a century now and when I pass them, for some reason I note if the are in operation or not. In the last years more and more windmills have popped up and it is quite interesting to drive by them at night. Every windmill have a red blinking light on top of them, probably to want airplanes, and when you drive by 100s of them at night all with blinking lights on top, it is quite interesting to see. Then there are old abandoned gas stations, stored, ranch houses etc. telling stories of passed times. I recently bought a new car that have a so-called dynamic cruise control. This means that it if you are going down the road with a set speed of 75 mph and you catch up with a car going slower, my car will slow down and just follow the car in front. This makes it even easier to drive long distances, especially on two lane high ways. In Texas though where the slogan is: “Drive Friendly – The Texas Way,” many drivers will pull over to the shoulder so a faster moving vehicle can pass on a two lane highway. When you drive across Texas in a day the sun is bound to go down before you get where you are going, and so it was on my road trip as well. On US Highway 84 between I-20 and Post, the sun did indeed go down in the west and the rest of the driving was in the dark. After post, the rest of the road was going straight west on US 380, through Tahoka, Brownfield, and Plains, TX. About halfway between Plains, TX and Tatum, NM is the border between Texas and Ne w Mexico. The worst thing about NM is that the speed limit drops form 75 mph to 65 mph. There is not difference on the road quality and it seems like NM should rethink how fast it is safe to drive down a US Highway in the middle of nowhere. Regardless, I am happy I am in New Mexico since I feel closer to my destination. I had meant to eat dinner in one of the small towns on highway 380 on the Texas side, but I didn’t find anything that was appealing so I ended up driving all the way to Roswell, NM before I stopped to eat. This turned to my benefit as a friend of mine in Austin who is from Roswell recommended I go to Peppers Grill & Bar, which ended up being a great choice. For over 30 years I have had an unwritten rule that if there is escargot on the menu at a restaurant I visit, then I need to order just that. So it was at Peppers and the escargots were excellent. So was the chopped steak I had as a main course together with a glass of Pinot Noir and it was all a good dining experience. I highly recommend Peppers and will come back next time I come through Roswell. As I left the restaurant, I also noticed snow for the first time of the day. It is weird that i left Austin in 72ºF weather and now 7 hours later there is snow. Now, Roswell is 3,000 ft higher elevation than Austin, so this may explain the snow, but for me, I had just driven through Texas and hadn’t felt the elevation change at all since it had happened gradually as I went westward. The last part of the drive, even in the dark, did make me feel I was going up in elevation. In the one hour plus drive from Roswell to Ruidoso, I gained about the same elevation I had gained from Austin to Roswell. The next day I wake up early and am excited to go skiing. It is a sunny day with blue sky and I leave the hotel around 8AM to drive the 45 minutes Ski Apache, which also brings me an additional 3,000 ft up of elevation. The bottom of the skiing area is at about 9,600 ft. I had previously bought the ski pass and rental equipment online as it offered 15-30% discount depending on how far ahead you purchase. I went to the ticket booth to get my ski pass and to the ski rental to get my equipment. I did pay $21 to upgrade to demo equipment, and that was worth every penny. I got to click into the bindings at about 9:40AM or so and I skied the whole day until 4PM when the mountain closed. I really enjoyed the day and I am definitely coming back to New Mexico for more skiing. 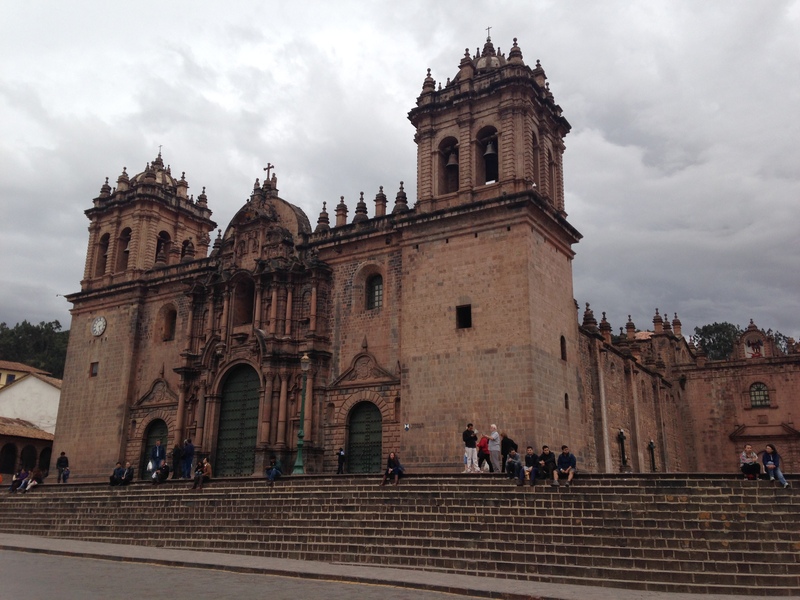 After arriving to Cusco airport I decided for a little adventure after reading a posting on tripadvisor and walked all the way out of the airport to get a taxi. 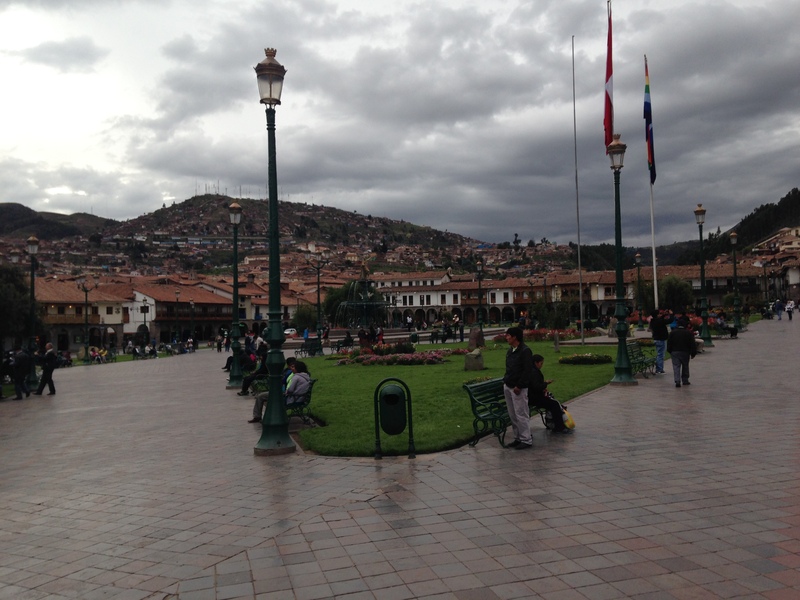 There were local people there hailing taxis and after about 5 minutes a taxi showed up that accepted an offer of less than US$2 from the airport to JW Marriott in Cusco. The hotel is a beautiful building that was built in the ruins of an old monastery called Convento San Agustín. 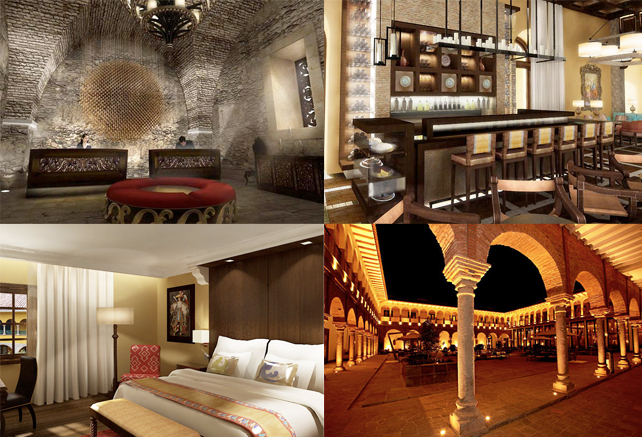 The hotel has kept old architecture features without sacrificing hotel amenities and comfort. 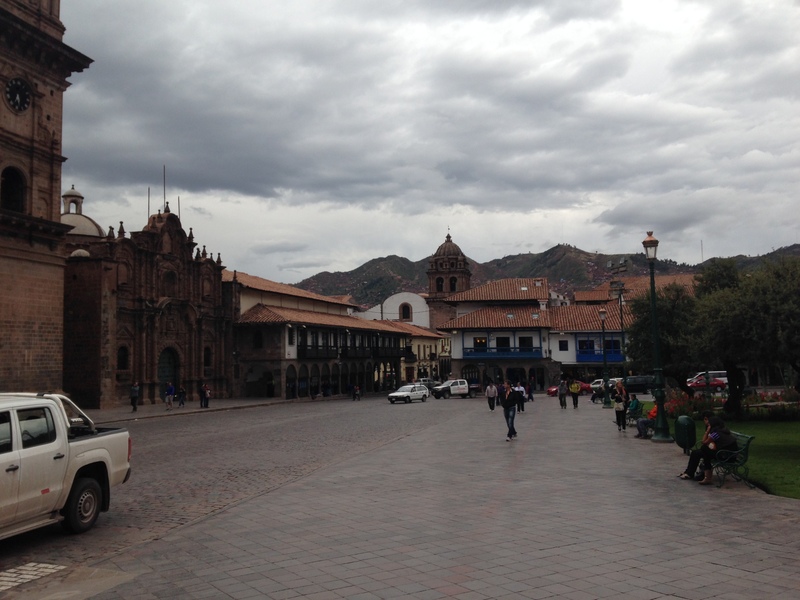 The hotel is just a few blocks from the main square called Plaza de Armas and it is nice to walk around the town, even though it was on and off raining the whole time I was there. The town looks very much like a Spanish colonial town and the main square is surrounded by the cathedral, another church, hotels, restaurants and shops. 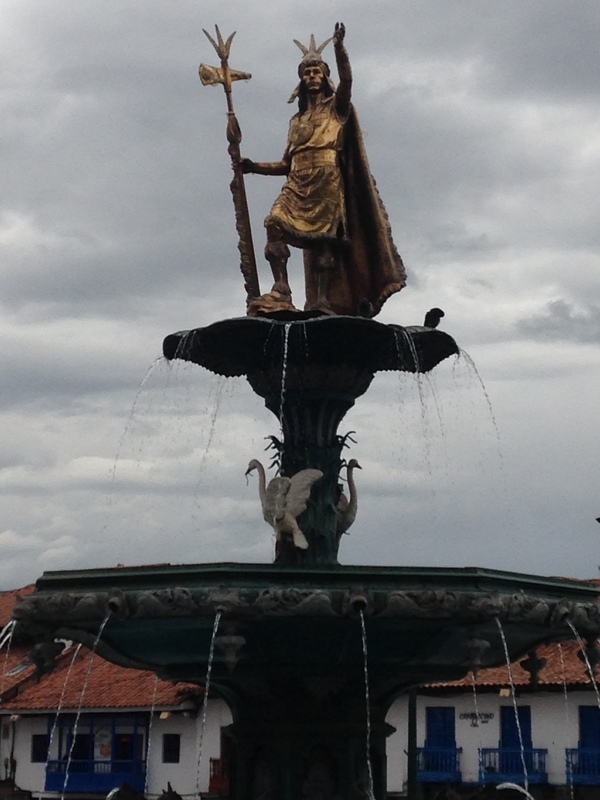 In the center of the square there is a beautiful fountain with a golden statue of an Inca. After Lima, this was another city that was required to go through in order to get to Machu Picchu. 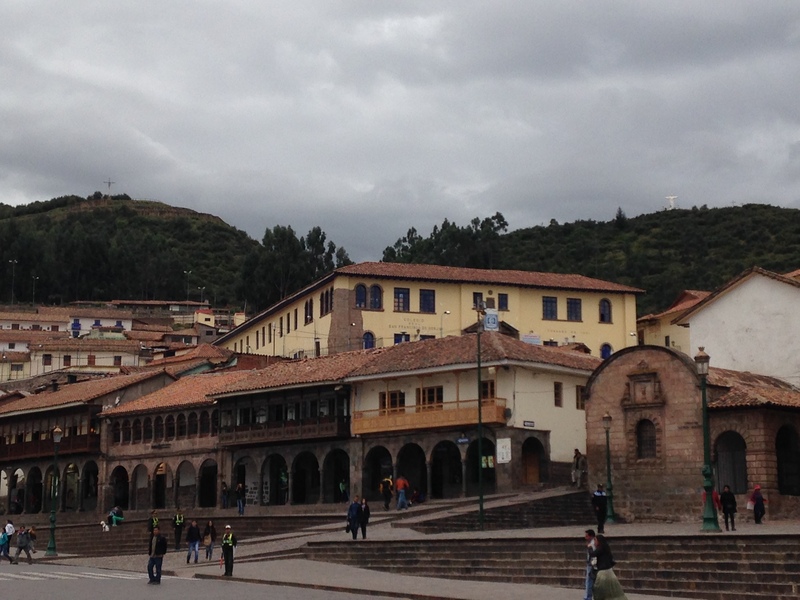 I stayed at the Marriott one night before going to Machu Picchu and one night when I came back before I took the train to Puno – more to come about that later. 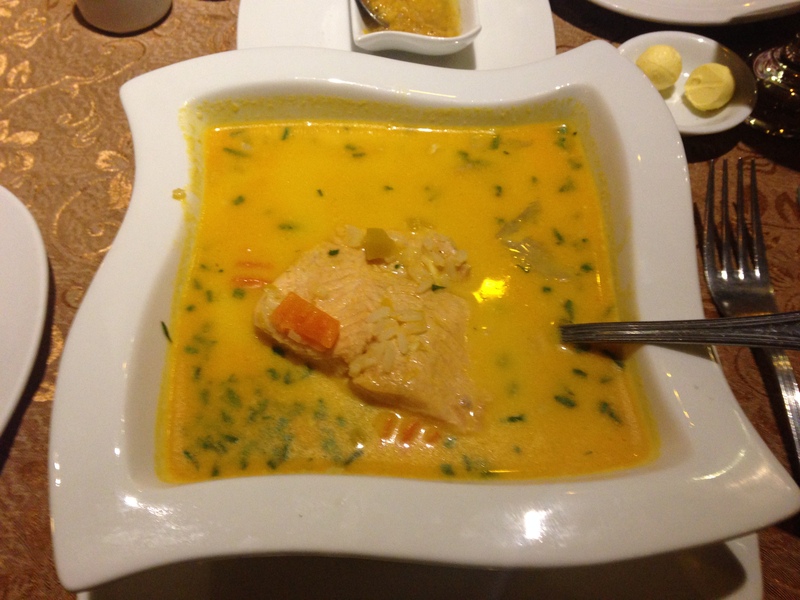 In Cusco I also got to try what ended up being my favorite meal in all of south America. It was the Chupe the Mariscos, or Chupe de Camarones. It was a thick seafood soup that sometimes has a fried egg on top of it. 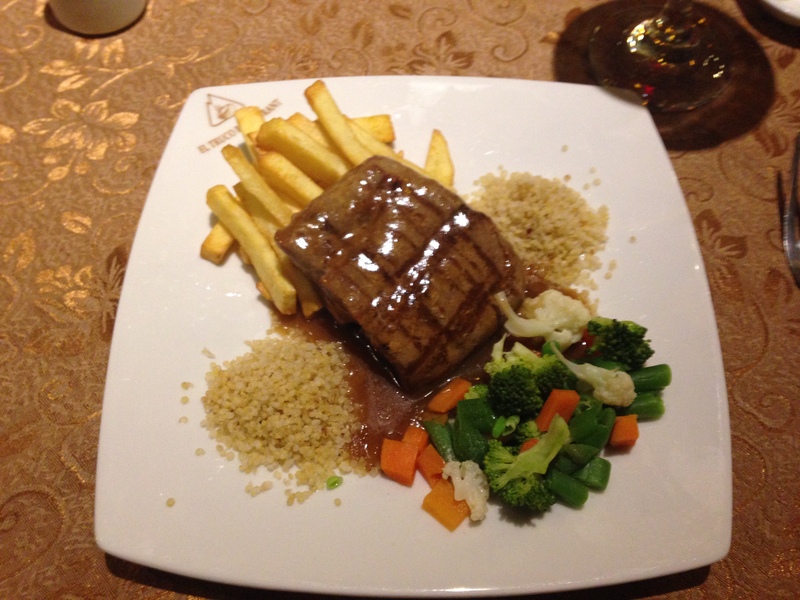 The dinner this day consisted of chupe de mariscos and than a llama steak. It was all delicious. Not much snow this year under the cable car. 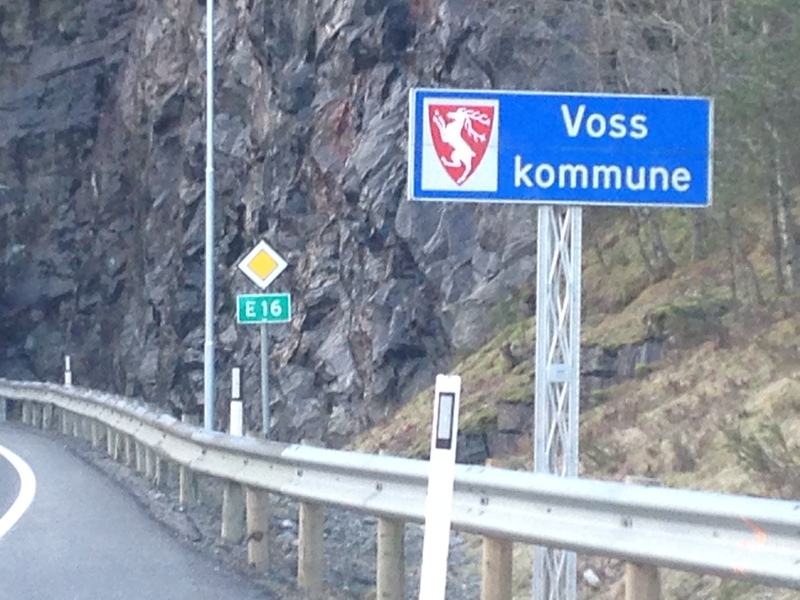 While growing up I used to take the train to Voss many Saturdays and Sundays in the winter to go skiing. I would take the bus (number 1 from Minde) to the train station in Bergen and then take the train to Voss, a train ride that would take about an our and forty five minutes. From the train station I would walk 10 minutes up to the cable car station where I could get a lift up to Hanguren. I had a season pass to the resort (then called Voss Ski og Fjellheiser) and had a voucher card for the train and I would bring hot chocolate and a big sandwich pack for lunch. 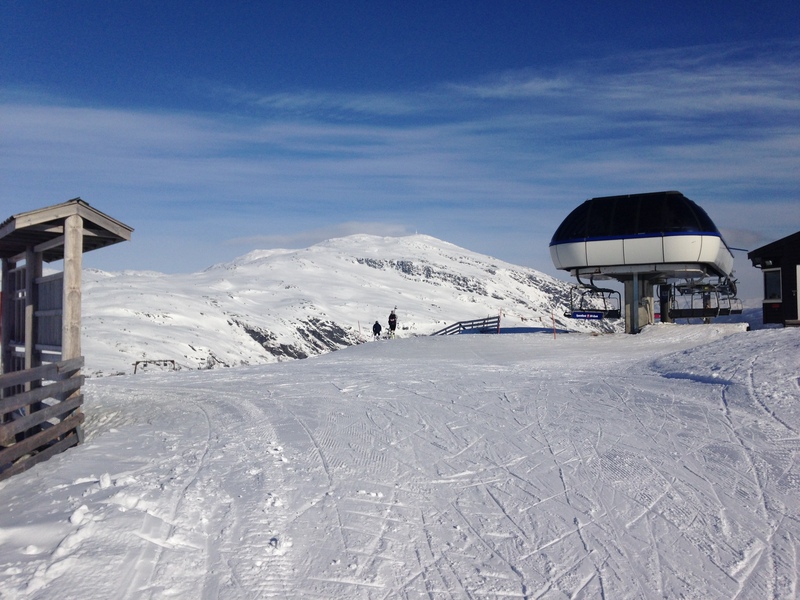 Well, it is now 2014 and it has probably been twenty years since I last skied at Voss. 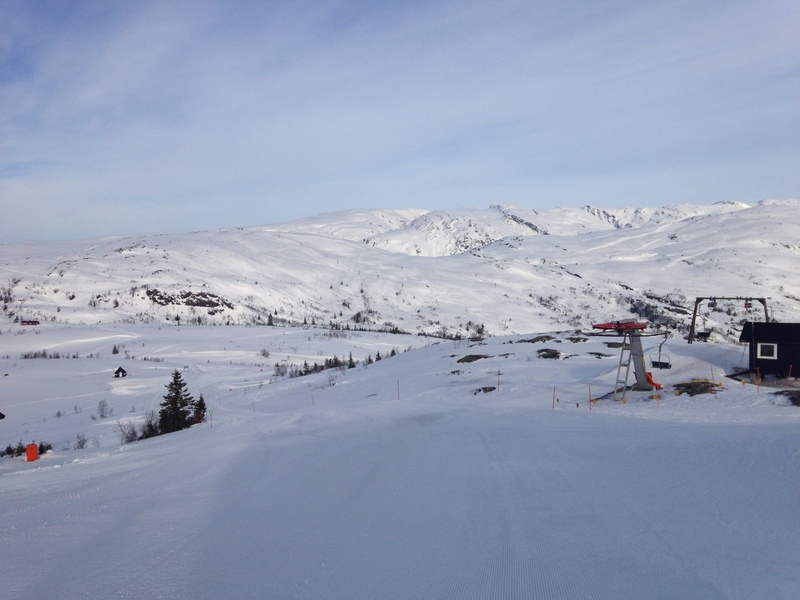 Two weeks ago when I was in Norway I decided I needed to go back and ski the slopes at Voss again. 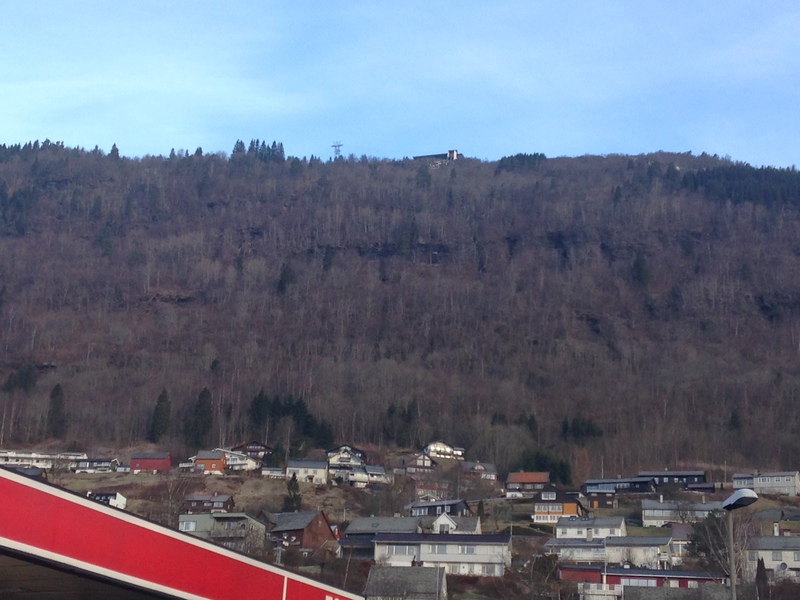 I was visiting my parents and they have recently moved to and island outside of Bergen, so I had to find the best way to get up there. I first had to drive 25 minutes from Drønen to Hufthamar and take the ferry to Krokeide. The ferry left at 5:55AM and took 35 minutes to Krokeide. The first picture is from the ferry as I am waiting to get off. 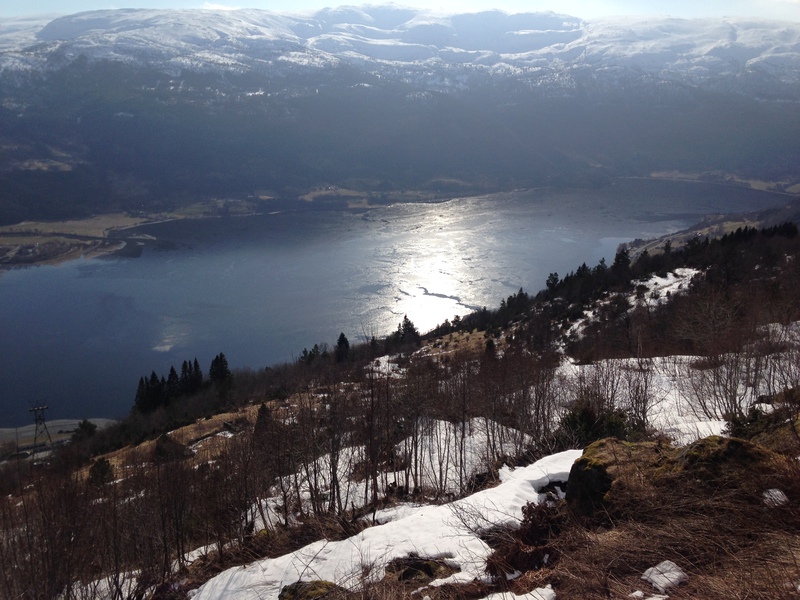 From Krokeide I drove to Arna and then in the Vaksdal, Dale, and to Bulken and Voss. 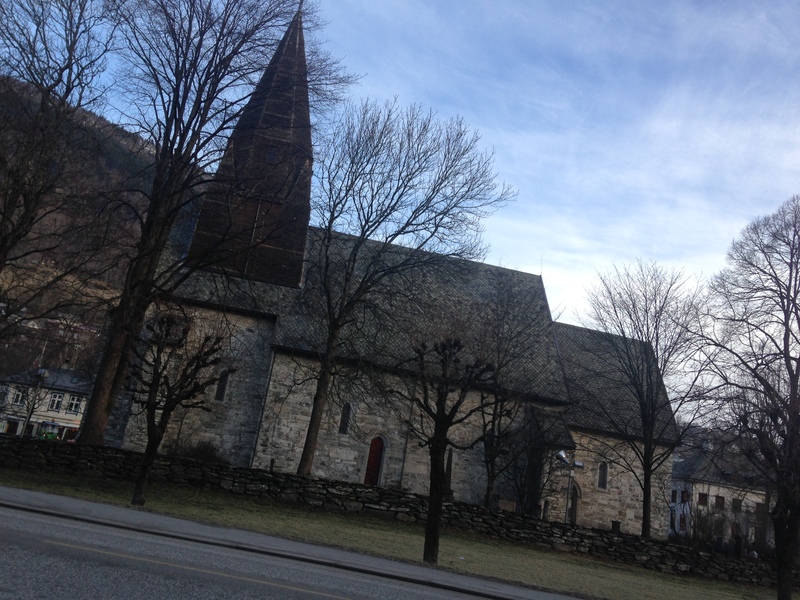 Finally at Voss, after about 3 hours of travel, I take a few pictures of Hanguren and the Church at Voss before I continue to drive up to Bavallen where I can park, get a lift ticket, and rent equipment. The ski rental place was supposed to open at 9AM, and i was there at 8:45AM and walked into an open shop with no people in it. I tried to find someone in there to help me, but no one could be found and I contemplated finding my own equipment before I left to get my lift tickets. When I came back the rental store was locked and I waited until 9AM when it opened. Andy from Austria, who lives in Greece during the summer, helped me fit boots, skis, and poles and got it all together quickly. I was out of there in 15 minutes and even though the lift wasn’t supposed to open until 9:30AM I was dangling my feet from the seat on the Bavallen Express lift at 9:15AM. There have been some new developments since I was last here. Last time I was here, maybe 20 years ago, there was a new quad chair lift added at Bavallen to supplement the original two-chair lift in Bavallen and a new T-bar lift was added from Hanguren to supplement the single chair lift there. Now the original Bavallen chair lift had been replaced with the faster quad express lift and the Hanguren single chair lift had finally closed down. From the top of the express lift I skied down to Slettafjell to find that the T-bar was still not running, but as soon as I arrived, the lift started and I think it is the first time I can say I was first up the t-bar at Slettafjell. 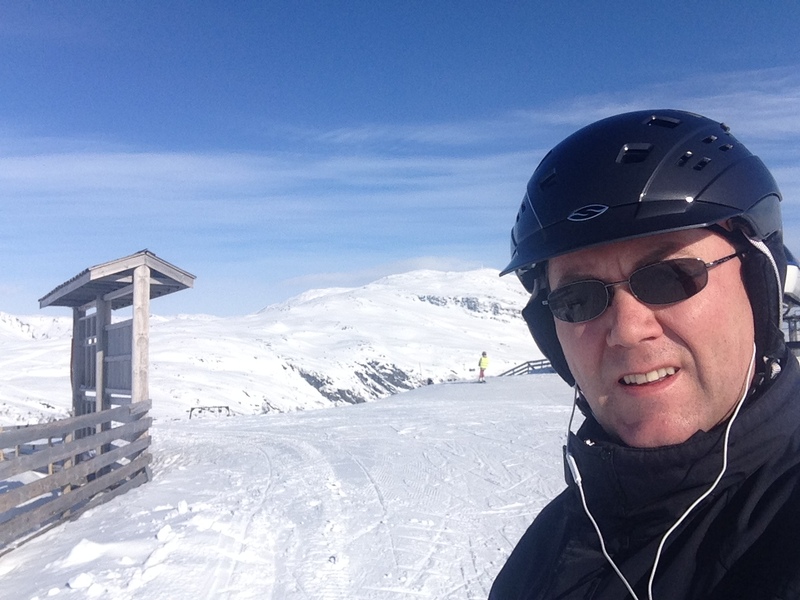 I don’t get to ski very often any more, and last time was during the Christmas Holiday at Hafjell in Norway. 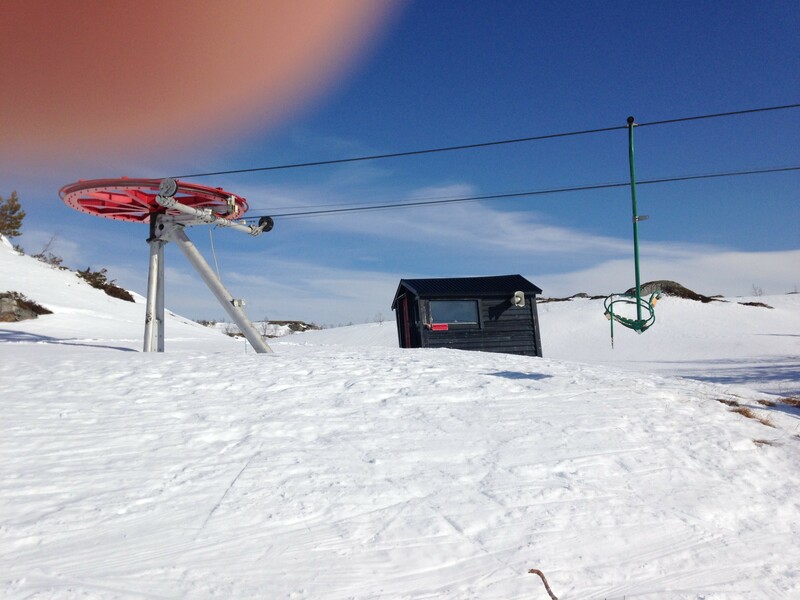 Then I skied for one and a half day and my legs were totally shot after that exercise. Needless to say, I was wondering how long my legs would last, especially since I was skiing alone and didn’t plan on taking any breaks except for lunch. 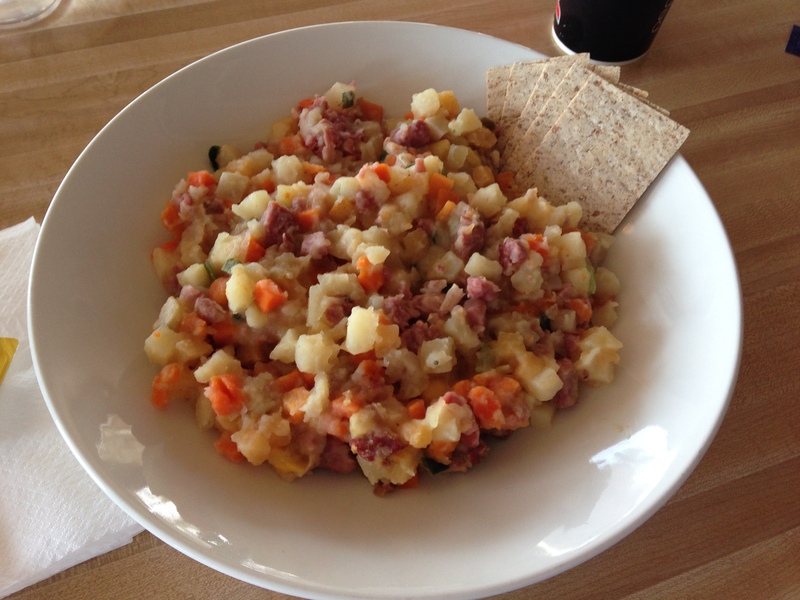 I skied all over the mountains at Slettafjell, at Horgaletter, at Ståstølen, and at Hanguren, and continued until 1PM when I felt I needed something to eat. I skied down to the top of the Hanguren Cable Car station and had lapskaus at the restaurant there. Interesting fact about lapskaus is that it still is the origin for calling people from Liverpool scousers. You can read more here or google it. 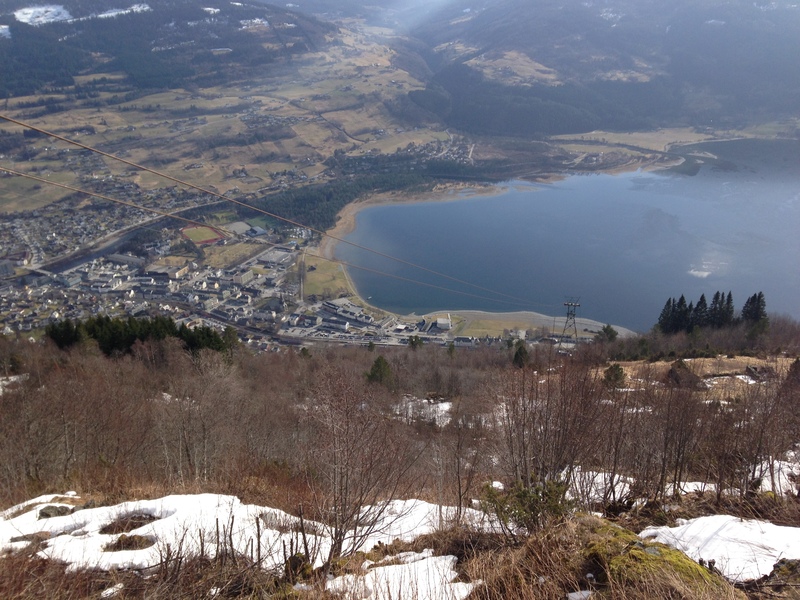 It was unexpected to see so little snow on the mountain below the cable car as you can see from the pictures both from Voss looking up and from the pictures from the restaurant looking down. 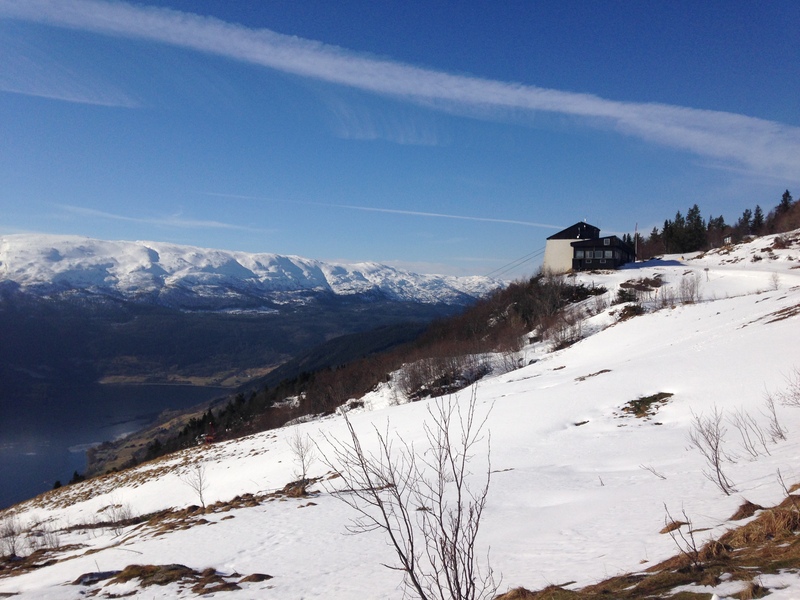 This year has supposedly been one of the mildest winters in Norway with very little snow. When I was skiing here as a kid I would often ski down from the cable car station to avoid an hour long or longer wait to get down on the cable car. This would obviously not have been possible this year. After lunch I continued skiing and my legs were holding out somewhat. I would have preferred to ski at Slettafjell and Horgaletten where the quality of the snow was the best, but found that the T-bar was preventing my legs from getting any breaks, so I decided to take the Tråstølen and Bavallen chair lifts every once in a while to rest the legs a little while being transported to the top of the mountain again. I skied until 4PM when the lifts closed down and after returning all the equipment, I traveled up to Tvinde, where there is a nice waterfall, to visit some friends I hadn’t seen in a while. 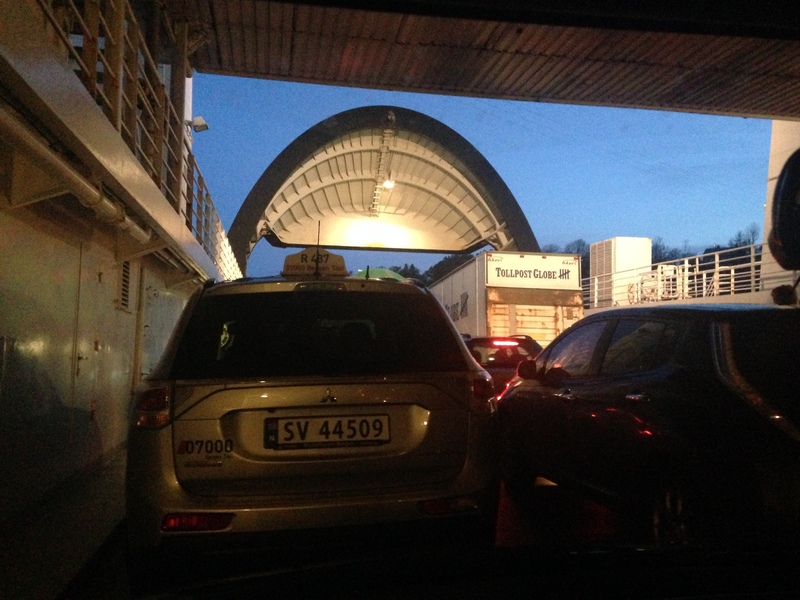 Then I drove back to Bergen and Krokeide to take the ferry back to my parents house at Drønen. 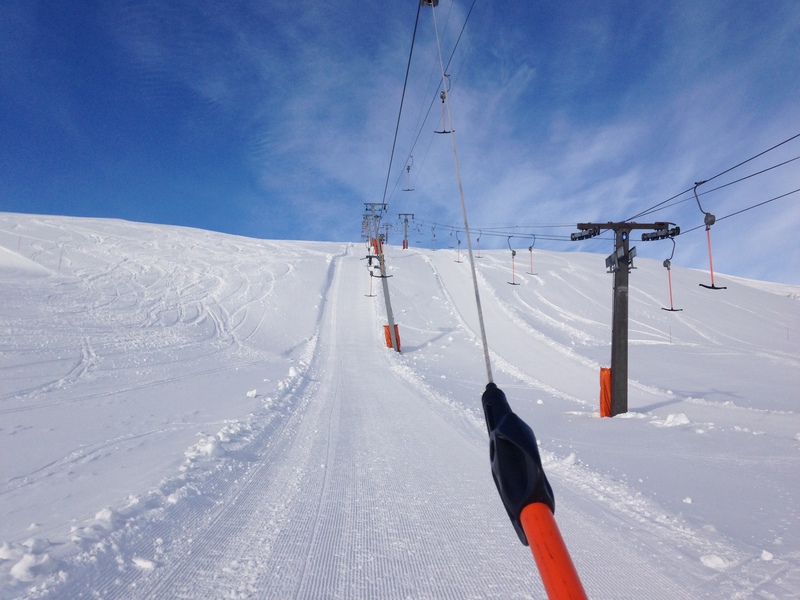 It was a great day skiing and the weather was wonderful. Some of the locals working the lifts said it was the nicest day this year and I felt lucky to see the mountains in the beautiful sun light. It made me want to go skiing more in the near future, but what do I do when I live in Texas? I may have to drive a weekend over to New Mexico, but it may be late in the season there? Me with Lønahorgi in the background. 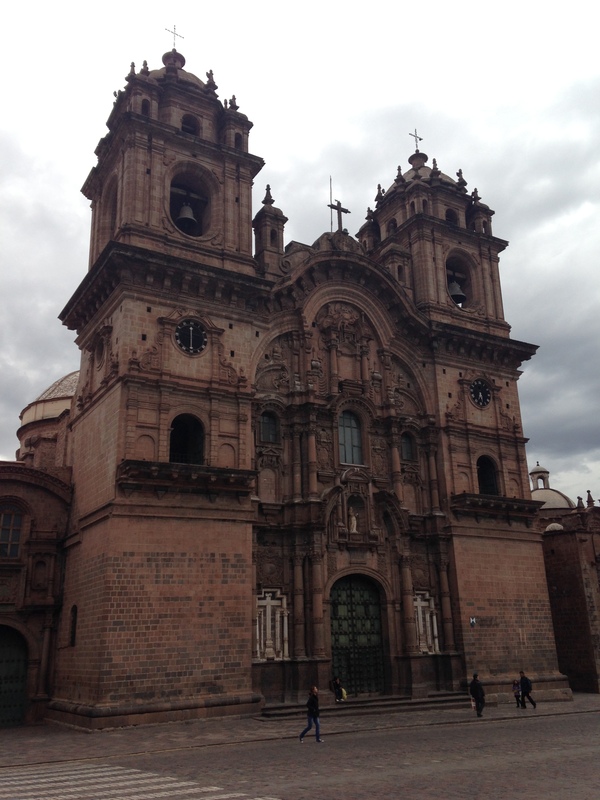 After a few days to acclimatize in Lima, I flew to Cusco. This meant going from sea level to 11,200 feet or 3,400 meters above sea level in less than 2 hours. I was warned against altitude sickness and had taken Diamox to prevent this from happening. Normally, I wouldn’t want to take the medicine, but I didn’t have much time to get used to the altitude so I opted to take it. Part of my research on Diamox revealed that it also is prescribed for glaucoma, and since I have glaucoma, I called my eye doctor who helped me make the decision to use it. Initially, I was concerned about the side effects, none of which ever materialized for me. South American Vacation starts in Lima, Peru. Last fall I went on a much anticipated vacation to South America. I hadn’t been down there for a few years and there where many places I hadn’t seen yet. There where a few countries I had never been to and some I wanted to see again. 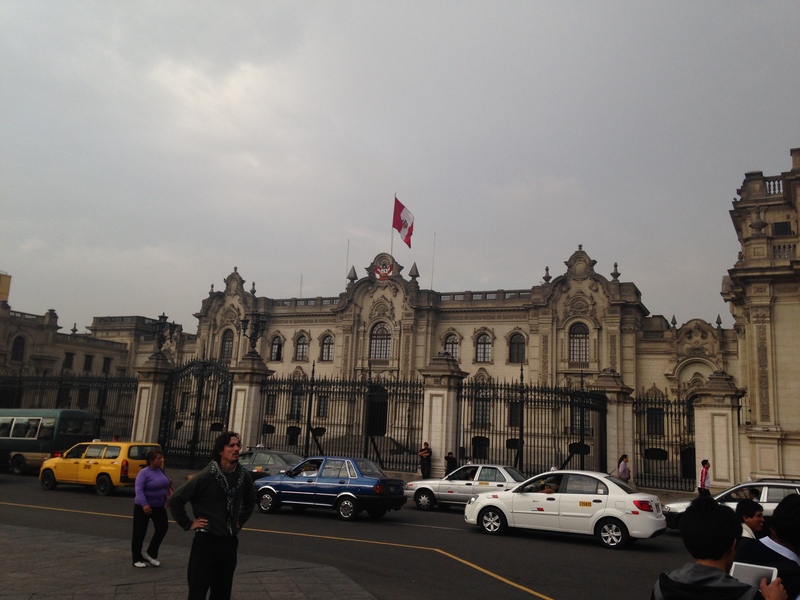 I booked my airfare about 9 month before the trip, flying into Lima, Peru, and returning from Santiago, Chile. The trip would bring me through Peru, Bolivia, Argentina, and Chile. 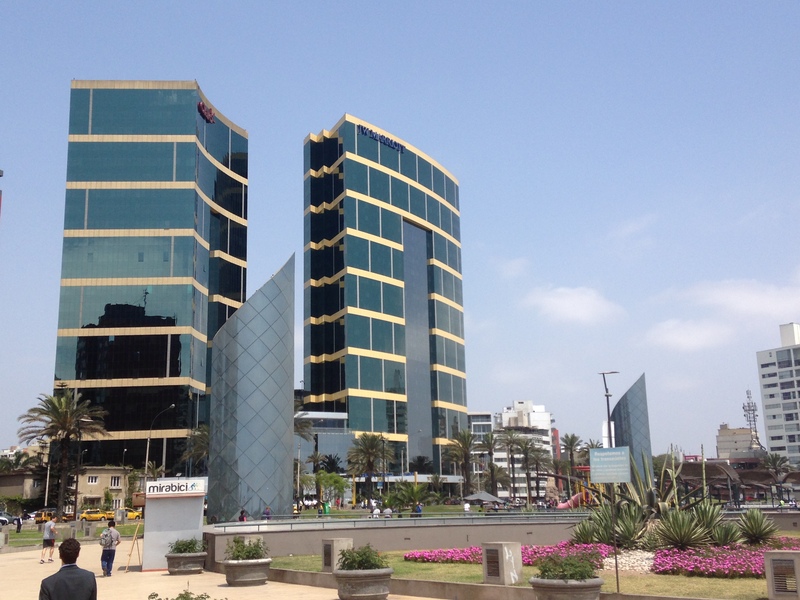 I stayed at the JW Marriott in Lima; it is in the Miraflores district close to the Pacific Ocean. I was upgraded at the hotel and ended up getting a nice suite that had a magnificent view of the ocean and the beaches, where there were a lot of surfers waiting for the next big wave. 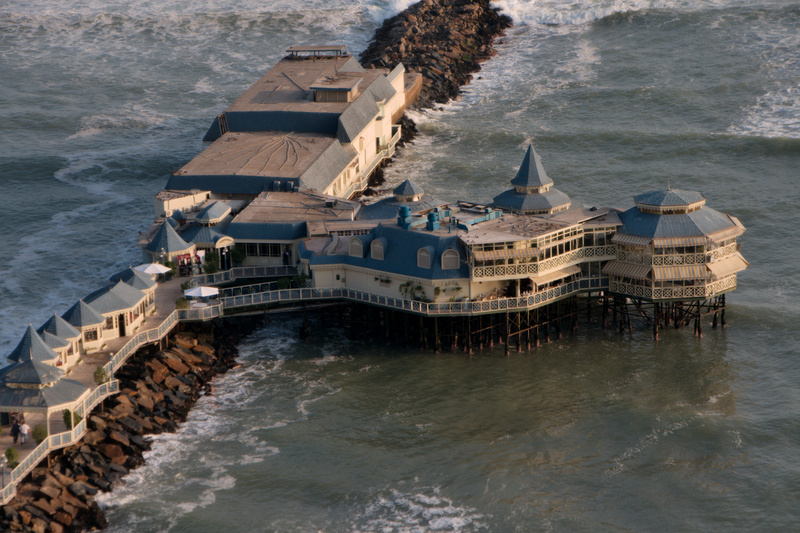 Miraflores is known for a wide range of restaurant and for lunch on the first day I went to La Rosa Náutica, located on a pier on the beach a 30 minute walk from the hotel. There is a cliff separating the city from the beach and the ocean and there is a large shopping center called Larcomar built into the cliff in front of the JW Marriott hotel. Walking up the hill again and another 8 miles or so further north along Avenida Arequipa eventually you will reach downtown Lima. I gave up about halfway and opted to take a taxi the last part. Around Plaza Mayor there are multiple things to look at. On the north side of the plaza, behind a wrought iron fence, is the Government Palace. 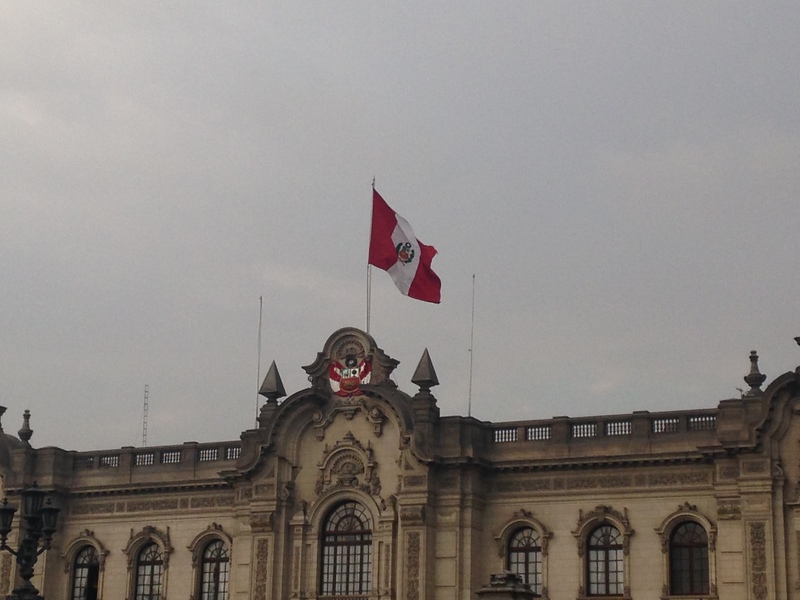 It has a large red and white Peruvian flag flying on the top which also makes it easy to spot. 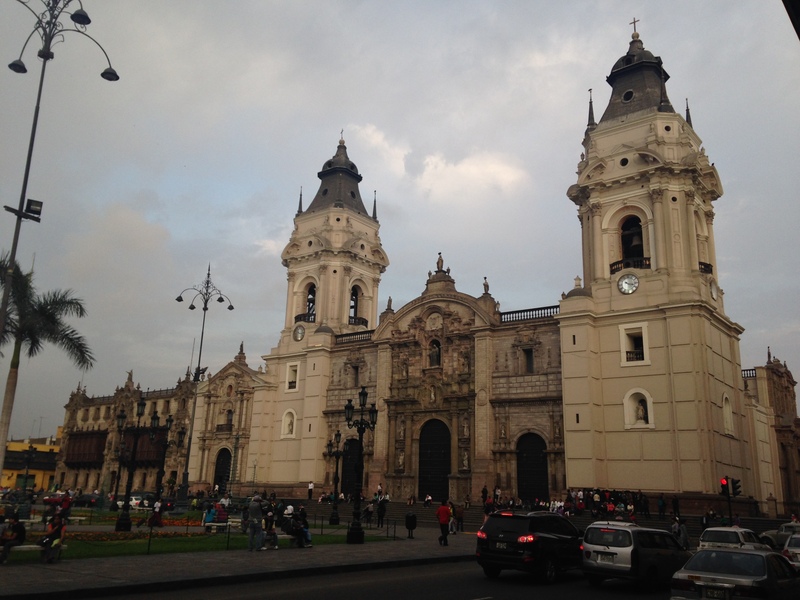 On the east side of the plaza the Cathedral of Lima is located. Together with the Parroquia del Sagrario and the Archbishop’s Palace. 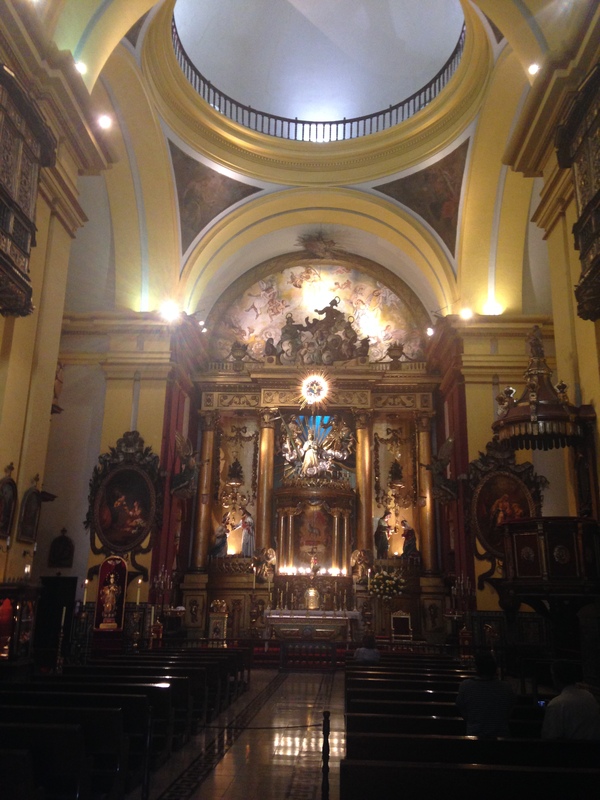 I went inside the catherdral and the Paraguia del Sagrario and both were very beautiful. On the west side of the plaza there were a few streets with many shops and restaurants and I sat down for a while to absorb the atmosphere and to enjoy a cold Cristal, one of the many very good Peruvian beers. Christmas preparations and there were lots of people listening to a children’s choir singing Christmas songs. This was a nice touch, but even though it was the end of November, I felt Christmas was far away, especially considering all the future sights and places I was travelling to before Christmas. I read a few month back that in order to appreciate how valuable time in our lives is we should calculate how many weeks we have left until we turn 75. Assuming I live to 75, I have 1515 weeks left to live. The advice continued to suggest you buy marbles for each week you have left to live and place them in a jar of some sort. Then each Saturday, you should remove a marble from the jar and throw it away. This Saturday was the day after I turned 46 and it was the second week i removed a marble from the jar. When I counted up the marbles to place in the jar, I was worried there wouldn’t be that many marbles to begin with. I was surprised to see that I do have “quite” a few weeks left! Taking one marble out on Saturday gives me the feeling of urgency in accomplishing the things I want to accomplish in my life. This urgency was also brought out when I read the book 20,000 days and counting by Robert D. Smith, the business manager for Andy Andrews. I anticipate every Saturday to come and I think the marbles will help remind me that time is precious and that we all have to be conscious of that fact.